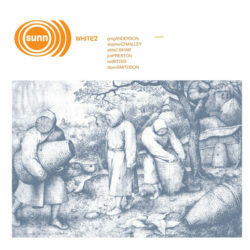 Sunn O))) have reissued their two White albums in high fidelity vinyl format. Originally released in 2003 and 2004 respectively, White 1 and White 2 were actually conceived as acoustic albums. But as Sunn O))) co-founders Stephen O’Malley and Greg Anderson note, the outcome of the recording sessions at Oregon’s Fontanelle’s Magnetic Park studios made for two psychedelic, electronic drone experiments.